Two hours later Jimmy was not in a hospital bed; he was at home breathing comfortably. Just to be safe the allergy nurse would be paying him a visit later that afternoon. Any would-be leader of improvement must recognise the indissoluble bond between improvement and change. Not all change is improvement, but all improvement is change. The relation derives from what I will call the central law of improvement: every system is perfectly designed to achieve the results it achieves. This aphorism encodes an understanding of systems that lies at the root of current approaches to making systems function better. The central law reframes performance from a matter of effort to a matter of design. The central law of improvement implies that better or worse “performance” cannot be obtained from a system of work merely on demand. (A system of work here means any set of activities with a common aim—a doctor's practice, a hospital, or a national health care system.) It implies that the results of health care, such as mortality rates or the speed with which we address a patient's anxiety, are themselves properties of our system of care, just as the length of my maximum long jump is inherent in the nature of my body (which is also a system). Mere effort can, of course, achieve some improvements. But such improvement is not fundamental; it does not often represent a new level of capability. Saying that performance is a system characteristic does not imply that performance never varies. Indeed, variation is inevitable. Waiting times go up and down; so do mortality rates. The central law does imply, however, a certain kind of stability—namely, that both average performance and the degree of variation about that average over time are characteristics of the system. Now along comes a well intended government minister or manager or doctor who wants to improve on the historical performance level of health care. Each, from his or her own platform, tries to cause improvement: the minister publishes league tables; the manager initiates internal audit and links pay to performance; the doctor promises to try harder. According to the central law of improvement, the results everyone wants to change are properties inherent in the system. Only if the league tables cause the creation of new systems can we expect new results. If not, not. Herein lies the link between improvement and change. If we do not like the current level of performance we must choose between change and frustra tion.1 You can see it clearly in the story of Jimmy. He ended up at home and not in hospital because the system of care—of home nebulisation, training for the mother, outreach nurses and home visits, and flexible schedules for consultants and cellular phones—had changed and was capable of sending him home safely and well. This change in Jimmy's care is change of a system, not change within a system.2 For Jimmy, change within the system would have meant my trying harder not to admit or waiting longer before doing so; using more of a familiar drug, not turning to a new one; getting the child more quickly to a nebuliser, not moving the nebuliser, the peak flow meter, and the skill to the home. We must be clear about the distinction between stressing the current system (relying on more of the same) and introducing a truly new system. The former butts without much effect against the walls of historical performance; the latter leaps over them. The new system of asthma care did not come from me. New systems do not bubble up from below. If we sketch a diagram of “the system of asthma care”—the network of cause and effect that sent Jimmy safely home that day—then the circles will contain the names of people, departments, rules, pieces of equipment, and the matrix of causes will stretch into the channels of nursing command, the purchasing systems, the rules of hiring, the design departments of equipment manufacturers, and the board of the health maintenance organisation where Jimmy and I met. The diagram will show that Jimmy and I are not causes much at all: we are mostly effects. The system could make us helpless; but instead it met our needs. Unified by a common aim, the system let this little boy go home. To create great health we must create great systems of care for health. Improvement begins in our will, but to achieve improvement we need a method for systemic change, a model for improvement. Nolan and colleagues have devised a simple and elegant model for achieving changes that are improvements (fig 1).3 Nolan's model comprises three basic questions and a fourth element that describes a cycle for testing innovations. What are we trying to accomplish? Improvement must be intended, and specific aims are crucial. If my daughter tries to learn to ride a bicycle she has a chance of success. If she sets off to “improve transportation” she might not. How will I know if a change leads to an improvement? Measurement is only a handmaiden to improvement, but improvement cannot act without it. We speak here not of measurement for the purposes of judgment (for deciding whether or not to buy or to accept or reject) but for the purposes of learning (such as from experiment, from others, or from history). What changes could we make that we think will result in improvement? This question addresses the central law of improvement en face. Since new aims require changes of systems, it is important to be able to identify promising changes and to avoid useless ones. Smart ideas for change can come from many places—from experts, from science, from theory, from experience. The plan-do-study-act (PDSA) cycle4 describes, in essence, inductive learning—the growth of knowledge through making changes and then reflecting on the consequences of those changes. Such inductive learning is familiar to scientists, but such formal cycles of action and reflection are unusual in daily work. Nolan's model intends that the enterprise of testing change in informative cycles should be part of normal daily activity throughout an organisation. This is what George Box has called “the democratisation of science,” and it amounts to little less than a new view of the nature of work itself. 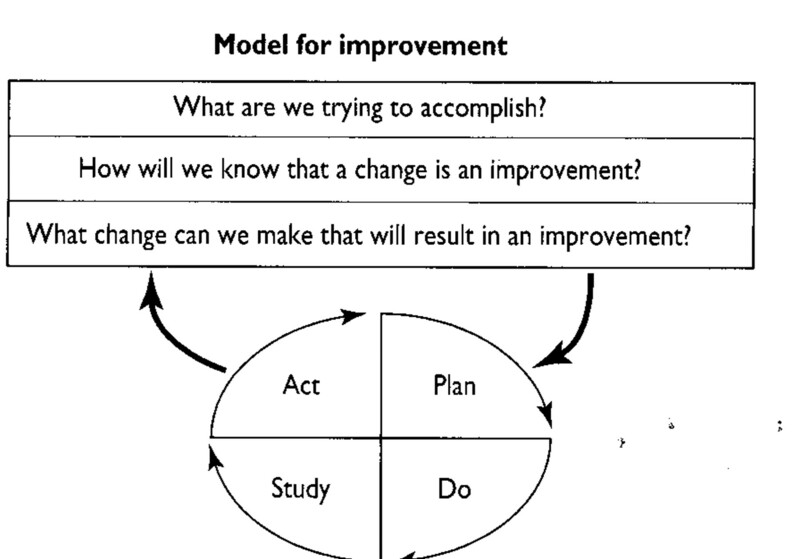 The simplicity of Nolan's model for improvement belies its sophistication. As we at the Institute for Healthcare Improvement have worked with dozens of organisations trying to achieve specific breakthroughs in performance we have seen how difficult it may be for leaders who intend to induce productive change. These four simple steps—set aims, define measurements, find promising ideas for change, and test those ideas in real work settings—challenge the mettle of the best and push against many deeply held assumptions. Furthermore, without repeated clarification, aims drift. I have seen a team working on reducing costs in an inpatient unit suddenly realise in its tenth hour of meeting that at least half of the group had come to feel that costs ought not to be reduced. No further progress was possible until they had again forged a shared aim. Many teams have found it useful to “recite” aims at each meetings, just to ensure that all members are still on board. Two specific properties of aims for improvement can be particularly helpful in building momentum for change. Firstly, aims should be ambitious. “Stretch goals” make it immediately obvious that the current system is inadequate and that a new one is required. In our work on reducing caesarean section rates the guidance group chose a reduction of 30% as the breakthrough goal. A less ambitious goal might have led simply to stressing the system to achieve marginal gains. By contrast, a safe reduction of 30% or more required fundamental changes in patient preparation, anaesthesia, labour management, and delivery technique. Secondly, we have noted how difficult it is to maintain focus on aims that matter to society—that affect the external customers of our work, like patients, families, and communities. It is sometimes easier to focus on internal reorganisation and improve in ways that are unimportant to outsiders. But it is meeting external needs that ultimately determines the success or failure of organisations. Reminding people of this and asking relentlessly, “What external needs are we meeting?” is a mark of effective leadership. Health care is in the midst of a love affair with measurement. Report cards, league tables, and mandatory reporting about, all in a search for better accountability and an informed consumer. Belief in the wisdom of the market runs deep. But the second question in Nolan's model has little to do with selection, reward, and punishment. It refers to measurement for learning. All learners need some form of measurement. Firstly, measuring helps one know if a particular innovation should be kept, changed, or rejected. My son, a middle distance runner, found his new shoes to be an improvement because his time in the half mile fell when he wore them. Secondly, measuring can help one understand causes. When the car stops the fuel gauge on “empty” tells us why. Thirdly, and more subtly, developing measurement helps to clarify aims; the answer to Nolan's second question helps refine the answer to the first. Our institute is working with 12 organisations to improve asthma care. They set out initially to try to reduce severe attacks and chose “visits to emergency rooms” as a measure. This led to a discussion of how emergency room visits are used and refocused the group on effective use of initial emergency visits to institute definitive care. They changed their measurement to “repeat visits to emergency rooms,” which better reflected their aims. This friendliness between measurement and aims comes as a surprise to many health care groups using the Nolan model. They are so used to experiencing measurement as judgment that they have forgotten the role of measurement in improvement. When leaders manage to overcome this fear they often run into a second barrier: the search for perfect measurement. The rooting of health care in scientific research has generated some myopia about the preconditions for inference. When we try to improve a system we do not need perfect inference about a pre-existing hypothesis: we do not need randomisation, power calculations, and large samples. We need just enough information to take a next step in learning. Often a small series of patients or a few closely observed events contain more than enough information for a specific process change to be evaluated, refined, or discarded, just as my daughter, in learning to ride her bicycle, sometimes must fall down only once to learn not to try that manoeuvre again. In measurement for improvement the best is often the enemy of the good. Health care is rich in sources of ideas worth testing in the search for improvement: medical journals, professional meetings, colleagues, consulting firms. In fact, good ideas are so abundant that one wonders why systems of medical care change so slowly.7 Patterns recur in the behaviour of leaders trying to introduce good ideas for change into the system of care. Mostly these are to do with overcoming resistance to change,8 the immense authority of the status quo in a complex human system. Effective leaders challenge the status quo both by insisting that the current system cannot remain and by offering clear ideas about superior alternatives. We have noticed that leaders who have a clear-headed view of a promising new approach—what Nolan calls a “change concept”—and who can explain it with confidence are more likely to succeed than those who merely state the new aims and leave it to the workforce to come up with the new ways to achieve those aims. Leaders cannot get by simply by “empowering” people to discover better ways to work. In practice the workforce rarely comes up with a new concept bolder than one that leaders have already put on the table as the alternative to the status quo. Two examples of powerful change concepts may show why this is so. One is the concept of “work removal,” the idea that work that helps no one should be stopped.9 Workers rarely do this of their own accord, even if they know the work is waste. The reasons are complicated, involving job security, incentives, and pride, all of which conspire to maintain the status quo. It takes a senior leader, fully confident in the general concept that systems normally contain major chunks of valueless work, to insist that such waste be found and removed. The empowerment comes in giving the workforce the time, authority, and safe harbour to find and remove the waste. Another change concept, even more powerful but even less likely to be discovered by a workforce, is continuous flow. This is the alternative to batching: making stacks of things to be worked on in due time.10 We stack things everywhere in health care—patients in waiting rooms, forms and equipment in bins, laboratory specimens for processing, and phone calls on hold. Most industries try to replace batch processing with a more effective and less costly continuous process flow; but this idea challenges basic assumptions in most health care systems. It seems self evident (even though it is not true) that continuous flow systems must be more costly, not less. The concept of continuous flow is at first so foreign that only senior leaders can insist on its use. On the other hand, leaders who do want to accelerate improvement by introducing highly leveraged concepts of change, such as continuous flow, need to give people time to assimilate and test those concepts. Most work systems leave too little time for reflection on work. It may be especially helpful to “walk through” actual work systems, especially when searching for waste that can be removed. A team of doctors, nurses, and others in a renal dialysis unit recently took the time, with some facilitation, to walk through their own unit to identify waste in supplies, time, equipment, motion, and other resources. Within an hour they had listed over 60 specific types of waste and could set about stopping many of them. The plan-do-study-act cycle is a mnemonic for testing changes in real work settings. It defines activities not normally part of work but which if made part of work can convert a system from at best a merely stable one to one capable of continuous learning. Effective leaders of improvement insist that the status quo should be challenged continuously through the active testing of promising changes on a small scale. Such testing is totally unfamiliar as part of normal work and most organisations resist the concept. The resistance comes in many disguises, such as the demand for perfect measurement, planning tests so large that they never occur, or extending the time frame (“We'll meet again next month”) exactly when it should be shorter (“We'll meet again tomorrow”). If we spoke a language different from English perhaps we would have a single word to link together the three facets of our quest: improvement, change, and learning. From the viewpoint of systems they are deeply united. The effective leader must understand that the road to improvement passes through change and that one efficient way to change is to learn from the actions we ourselves take. In trying to escape from the fetters of historical performance the leader of improvement places both popularity and certainty at risk. But this is what it took to send Jimmy home safely in his mothers arms; this is what it will take in the future to improve the lot of those who place themselves in our care. .A framework for the continual improvement of health care.Joint Commission Journal of Quality Improvement1993; 19:424–47. .Change: principles of problem formulation and problem resolution.New York:W W Norton,1974. .The foundation of improvement.Silver Spring, MD:API Publishing,1992. .The fifth discipline: the art and practice of the learning organisation.New York:Doubleday/Currency,1980. .The evolution of cooperation.New York:Basic Books,1974. .Eleven worthy aims for clinical leadership of health system reform.JAMA1994; 272:797–802. .Overcoming organizational defenses: facilitating organizational learning.Boston, MA:Allyn and Bacon,1990. .Quality improvement through waste reduction.Chicago, IL:University of Chicago Graduate School of Business,1993. .Toyota production system: beyond large-scale production.Cambridge, MA:Productivity Press,1988. .Doctors' decisions and the cost of medical care.Ann Arbor, MI:Health Administration Press,1986. .Quality is personal: a foundation for total quality management.New York:The Free Press,1993.